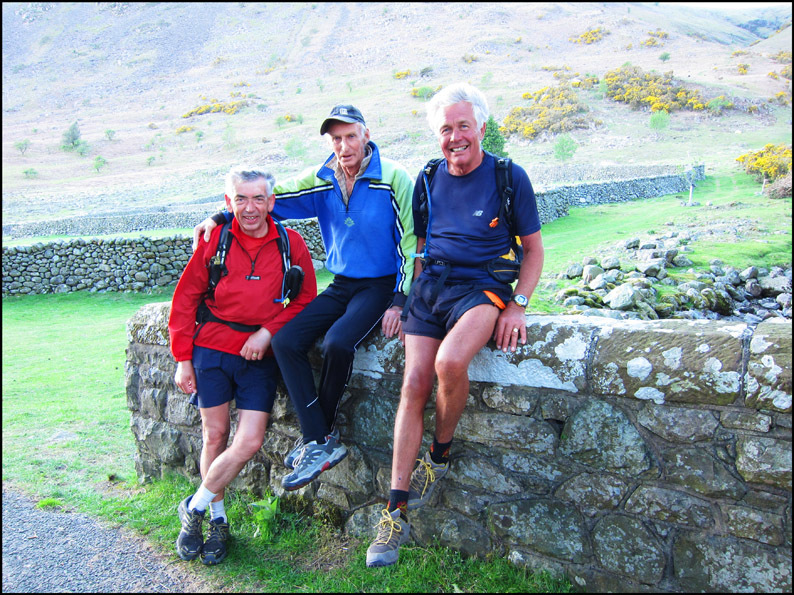 When my friend and walking companion, Tony Richmond, first mentioned the JNLC I was sceptical until I learned that our age group of over 65 was allowed a generous 24 hours in which to complete the course. 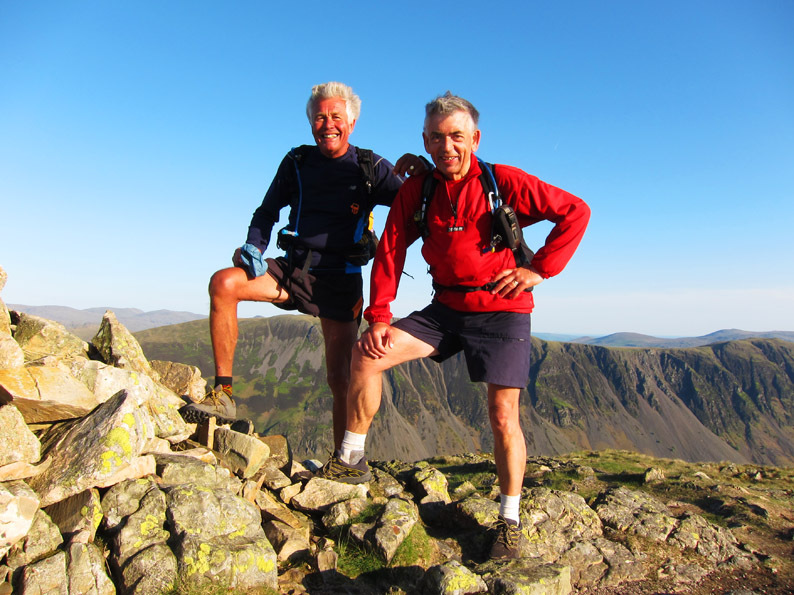 Membership of the ‘club’ is open to over 50’s only and the qualifying times vary according to age from a mind blurring 12 hours at 50 to the more relaxed time for us wrinklies and has been described as a ‘Bob Graham’ for the aged! 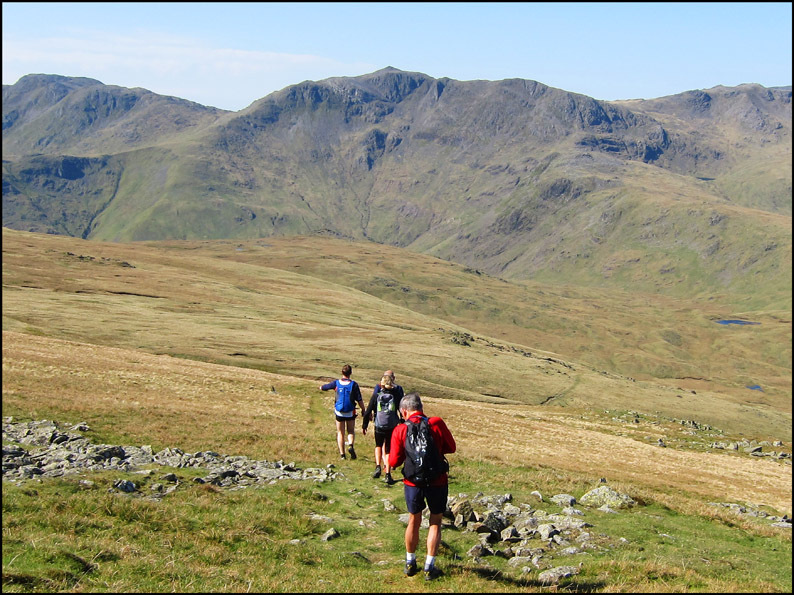 The Challenge is an anytime traverse of many of the major Lakeland peaks starting on Pooley Bridge and finishing next to Joss’s house in Wasdale. The route is billed at 48 miles though my feeling is that it is a few miles light of this but the real killer is not the distance but the ascent (and descent) of 17,000 odd feet which is certainly not in question. My initial optimism over our more generous time limit was soon quashed as Tony announced his desire to aim for 15-16 hours. A compromise was reached and it was agreed to aim for an 18 hour schedule (designed for the 60-64 bracket) with a 2am start on 1st May 2011. So it came about that four of us left Pooley Bridge on a fine though windy morning. Our pacers were Clare, using it as a training run for her impending BG attempt, and her equally fit and youthful running partner, Richard. Once clear of the elusive gate out of the first field onto the Howtown road and onto the fell we quickly got into a climbing rhythm on the long ascending ridge to High Street. Though dark the familiar landmarks of Arthur’s Pike, Loadpot and Wether Hill were passed in the torchlight and on High Raise a backward glance showed a magnificent red impending dawn. As it grew lighter torches became unnecessary for the rough descent into and out of Threshthwaite Mouth and we tumbled down to meet Janet at Kirkstone right on the clock. 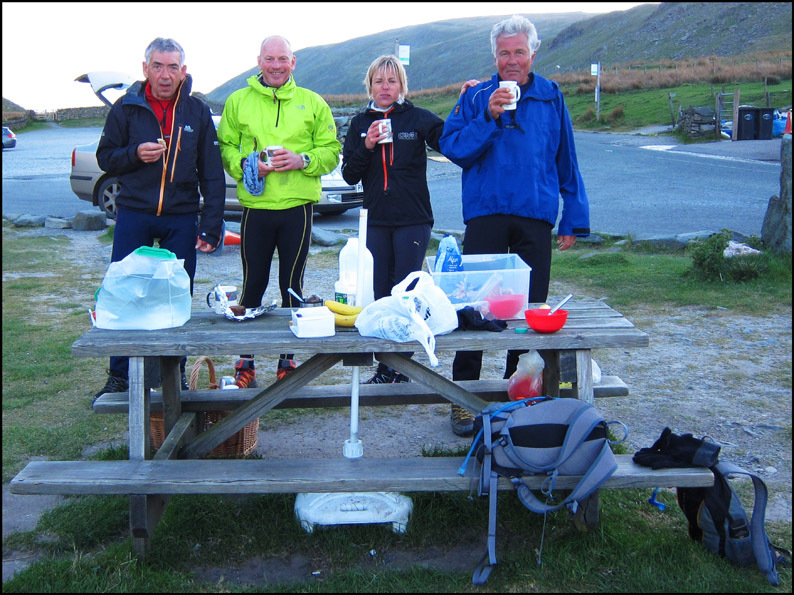 After a brief interlude involving welcome tea and Alpen the chore of climbing Red Screes loomed as we continued, still well dressed, into the chilly morning. Hart Crag, Fairfield and Seat Sandal passed uneventfully and a steep descent to Dunmail Raise saw us some 10 minutes early at Joan’s check point. Soup’n sarnies were enjoyed as we made the welcome acquaintance of Monica Shone and her husband who had come to give us moral support on behalf of the club. The frisky breeze threatened to blow anything not nailed down across the main road. Still on our schedule we left in the company of additional pacer, Simon, for the short though vicious ascent of Steel Fell. It was obvious that we were now into the meat of the Event with no more road crossings until the end. Though we were plagued all day by the strong and noisy easterly at least it was in our favour and prevented overheating as the day was blessed with unremitting sunshine and continuing superb visibility. Descending from High Raise the ramparts of Bow Fell looked impossibly forbidding and though I looked eagerly at the tarn on Stake Pass a refreshing dip was narrowly avoided. We found a good line on the trod up Bow Fell which I have always known as ‘Billy’s Rake’ from old BG days. The route to Sty Head was then straight forward and we were able to pick up time arriving about 30 minutes ahead of schedule thanks to a surprisingly uneventful descent of Great End which had proved a problem on previous reccies. As we hid from the wind behind the stretcher box Joan dished out more goodies and replenished our water supplies from the eight litres she had womanfully carried up from Seathwaite. A brief lull here and we soon discovered the Challenge was now only really beginning. Gable’s summit was reached in good order despite the best efforts of the wind to blow us off the pitched path. From then on the difficulties increased with a long sequence of rough descents and ascents until the terrain eased after Steeple. The climb onto Pillar seemed never-ending despite a welcome five minute sit in the sun – our only concession to normal behaviour throughout the day. With three hills to go our time advantage was still intact though the descending was taking its toll on my fragile knees as I struggled to keep in contact with the group. However a good line off Haycock lead to the steep steep pull onto Seatallan and spirits rose with the end in sight. The final summit of Middle Fell was reached with glee though I could manage little more than a shamble down to Greendale Bridge where we were welcomed by the ever efficient Janet and the gaffer himself. After a few brief words of congratulation he signed Tony’s book – Joss’s autobiography – and informed us we were numbers 111 & 112 in the club. I fear this had little initial impact as we travelled the long journey back to Penrith but as our achievements sunk in we were proud to become the newest members. For those wishing to emulate our experience, simply contact Monica Shone and you could become the proud possessor of a tankard with the right to attend the annual dinner held at Santon Bridge every October. For the record our time for the Challenge was 17 hours 21 minutes.